The National Museum of the American Indian has published some excellent books. Sometime back I wrote about their Do All Indians Live in Tipis? Today I point you to another one. 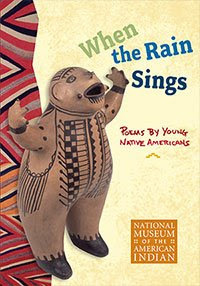 When the Rain Sings is a book of poems written by young Native people from several tribal nations: Ojibwe, Lakota, Omaha, Navajo, Cochiti/Kiowa, O'odham, Yaqui, Hopi, and Ute. When the Rain Sings was first published in 1999. The story behind the book is included in this new edition, which is dedicated to Lee Francis, the founding director of Wordcraft Circle. Through the committed work of Lee Francis and others, we've got more Native writers than ever before. Most of the poems in When the Rain Sings are paired with an item at the museum. Rainbird Winters' poem "Manido Mashkimod (Spirit Bag)" is about bandolier bags. Alongside it is an Ojibwe bandolier bag. Teachers who use the book will find the teaching guide helpful. It is on the "Ideas for the Classroom" page created by NMAI. There you can see three of the poems in the book. The book is available from NMAI for $14.95.